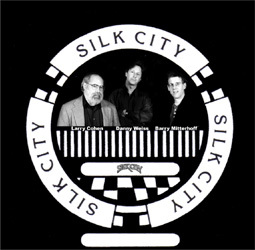 Silk City (Barry Mitterhoff, Danny Weiss & Larry Cohen) is a string band with a sound as unique as their repertoire. Mandolin, guitar and bass blend in a breathtaking variety of styles including hard-driving bluegrass, wide-ranging ethnic music, sparkling original vocals and instrumentals and audience favorites like the "Wizard of Oz Medley". 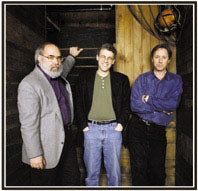 The trio combines exciting, interesting arrangements and meticulous delivery with a hard-hitting sound that will enrapture acoustic music lovers. Barry Mitterhoffs stellar mandolin stylings, Danny Weiss heartfelt guitar and vocals, and Larry Cohens propulsive bass combine to produce a fresh and exciting band sound that nevertheless reflects the polish of musicians who have performed together for many years, recently as the rhythmic heart of Skyline. Silk Citys music is dazzling yet accessible, innovative with a sense of tradition, for the serious listener yet always delivered with a light touch. The trio is one of the most exciting new additions to the acoustic/string music scene. They have no new name for their sound - its just great music, thoughtfully put together and artfully presented by three individuals committed to their audience and to the further development of acoustic music in the 21st century. Danny Weiss is the guitarist and lead singer for the trio. His double-edged talents as a singer and a player make him sought after by many groups. Along with Mitterhoff, Cohen and banjoist Tony Trischka, Danny was a founding member of the pioneering new-grass band Skyline. He has appeared with Tex Logan, Vasser Clements, and David Bromberg. His great sound and unique soloing has been recognized by Frets magazine and he has been featured recently in the soundtrack of Disney's 2002 release, The Rookie, as well as in concerts and workshops both nationally and recently in Spain, Russia, and the Czech Republic. He also moonlights as the Director of the Fanwood (NJ) Memorial Library. Larry Cohens ability as a monster bass player, arranger, and record producer first earned public recognition through his work with Skyline. He has since produced innovative acoustic albums for Barry Mitterhoff, Jay Ansel, and Akira Satake, and performed with Nick Jamison, Darol Anger, and Mike Marshall. A joy to watch on stage, as well as to listen to, Larrys approach is informed by his background in classical, jazz, and rock music, and by his innate sense of musicality. Mandolinist Barry Mitterhoff has developed an international reputation for his versatility, having adapted the mandolin to, and mastered musical styles as diverse as bluegrass, opera, Jewish klezmer, Dixieland, old-time, classical, Brazilian, Italian and 19th-century American duo-style. Barry is currently an active member of Hot Tuna, and has performed with guitarist Jorma Kaukonen, banjoist Tony Trischka, appeared at the Metropolitan Opera with renowned singer Jerry Hadley, played and recorded with folk-singer Tom Chapin; appeared at the Smithsonian Institute and elsewhere with hard-hitting singer, songwriter and labor activist Hazel Dickens and performed with innovative "free" music composer Eugene Chadborn at New York Citys Knitting Factory. In addition, Barry has performed at Carnegie Hall, the Library of Congress, the White House, the Metropolitan Museum of Art and New Yorks famous Rainbow Room, and has performed in concert and at music festivals throughout the U.S., Canada, Japan, and Europe. He's contributed music to the score of films such as You've Got Mail, Mickey Blue Eyes, Two Family House,the Coen Brothers', O Brother Where Art Thou and The Rookie.Barry is also the most current member of Hot Tuna!